In the early 1980s, around five million people, with an average stay of three days per head, visited the state annually. Tourism was earning an impressive Rs 12,000 crore for the state every year -- besides employing two lakh people. 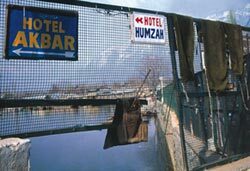 Beginning 1989, militancy curbed the tourist inflow drastically. By 1991, hardly 10,000 tourists were visiting the Valley per year; during 1991-95, the state received only 2,000 tourists a year. After a brief upsurge just before the Kargil conflict -- the state received 69,000 visitors a year in this period -- tourist inflow slackened once again due to the Indo-Pak stand-off and a spurt in terrorist activities. In its days of glory, buyers for Kashmiri handicrafts -- particularly carpets -- came to Srinagar to place advance orders. The trend has reversed; weavers beg for orders from buyers now and get paid in instalments, sometimes ranging over months. Gulam Rasoli Tibu, a carpet loom owner, used to earn Rs 1 lakh a decade ago. "Now, I hardly get Rs 20,000 a year and that too for the carpet I sold last year," he laments.